Cheap lights are great for knock-around work or loaning out, or walking the dog. Good lights get used for more serious work - hunting, bedside table, and so forth. I like the G2Ls - they're bright, batteries last forever, and they're durable. They are not, however, inexpensive - at $60-65 each, it's not unreasonable but also not chump change. The biggest downfall of most LED lights - in my opinion - is the desire to build too many whiz-bang features in, instead of just making a light that works. High/low beam? Sure. That's useful, particularly when "high" means "sear your retinas out and leave a silhouette on the wall behind you" and "low" is "enough light to check the animals/walk the dog and not completely destroy my night vision". I don't need an SOS blinker, a party strobe, six more brightness levels, and half-click or fast-click switches to get between modes. I want on, off, and *maybe* high/low. Surefire does this well. MagLite has done this well. Leatherman does it pretty well. I'm not completely sold on the aluminum construction; I tend to be a little rough on my lights and I'm not sure how this one would hold up to a drop from the roof or similar. I know the polymer G2 can handle it just fine. Initial feel of the light is good - it's big enough to hang on to but not unwieldy. The front bezel could probably use a drop of purple loctite to keep it tight - it seems to have a penchant for loosening up. The tailcap switch is recessed, so accidental turn-ons shouldn't be a problem at all. The longitudinal ribs milled in it help with the grip a little bit, but it's not as positive as the checkerboard pattern molded into the Surefires. If it's wet or cold, I wouldn't expect to have a good grip on this thing. Back to the switch - MagLite uses a "fast click" to change modes. The initial "on" is to "high". Two fast clicks take it to "low", and three is a "strobe". It seems to be pretty sensitive to how fast you click it - not a great feature, IMHO. I'd much prefer a half-click to change modes. Beam quality seems to be good - no obvious hot spots, good throw. Is it a replacement for the G2Ls? Not quite - it just doesn't feel quite as durable to me. As a murse/kitchen drawer/glovebox light, it should be excellent though - and mine is now residing in my Maxpedition bag, replacing the AA MagLite that had been in there. That said, I have to give major kudos to the folks at LaserLyte for their handling of the return. I first emailed them last Sunday to start the process, and had a reply from them Monday evening (afternoon for LaserLyte, as they're in Arizona). The rep who answered my email (Nikki) has been my point of contact from that first email, and after a couple email exchanges* she arranged for a new laser - tested in-house - to be shipped to me. No deposit, no returning the current laser first, just, "The new one is on the way, we tested it, please send back the defective one." I was expecting it would show up in four or five days. I was mistaken. LaserLyte shipped the replacement by 2-day air, and it arrived yesterday. In addition to the replacement laser (in its blister pack, which had been neatly sliced open and then re-taped with a label saying "Personally tested and inspected by Elizabeth") there was a pre-paid mailing envelope to return the defective unit, and a 12-pack of replacement batteries (three complete sets). I grabbed my 'smithing hammer and brought the slide for the M&P to work with me this morning, and spent about fifteen minutes tapping the old sight out and the new one in. The punch they include is sized perfectly for the job, and anyone with a tiny bit of common sense should be able to handle it. So - LaserLyte - thumbs up on *excellent* customer service. 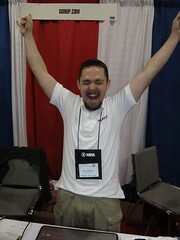 I will likely be looking at some more of your products for training aids in the future! 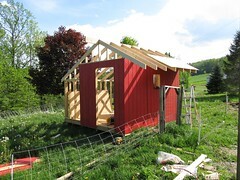 I spent most of Saturday working on the barn, in hopes of having things done before the chicks are ready to move out. I made a fair bit of progress, given that I was working solo. I started by getting the last set of gable rafters in place, then figured my overhangs and made the tail cuts and squared those off for 1x6 fascia boards. 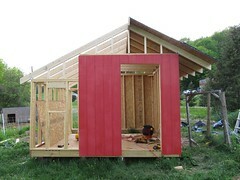 Gable studs went in quickly, and I framed out the other window. 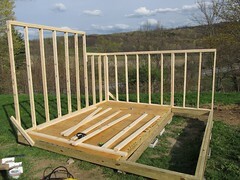 Another three sheets of siding went on, and I started the roof decking. It's pretty impressive how things get tied together and stiffen up as each successive layer goes on. Floaty joists locked down floppy skids, floor decking stiffened that right up; sloppy walls were squared up with sheating, the whole wall assembly was tied together by the rafters, and the roof deck has made the half that's done essentially immoveable. Yes, this is my first major ground-up construction project. If I can get one more good dry day of work, I should be able to finish the siding and roof decking, especially if a second pair of hands is around. 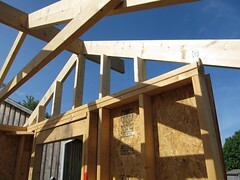 The roofing itself should only take me a day; two squares of up-and-over is simple. When that's done, I have to frame out the interior walls and half-walls and then put in the windows and door ... and it's done. Doesn't sound like a lot, and truthfully it isn't; if I can put another 25-30 hours in I should be set. Somehow I missed downloading this picture from the convention, and for shame - because I happen to think it is a pretty good shot of Jay. He even cleaned up pretty well. 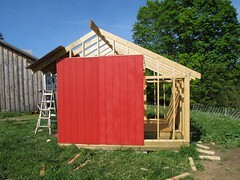 I took yesterday morning off from the Day Job in order to work on the barn, as the forecast was moderately OK. Aside from two quick showers, the weather was pretty good, and I got a lot done. 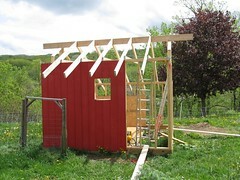 As I mentioned in the last barn-related post, I'd fubared my ridgepole height, and was left trying to decide if I wanted to re-cut the rafters to the right angle, or raise the ridgepole to the correct height. I looked at the issue some more, and decided that since the end wall was built to have a 6/12 rafter sitting across the top, I really needed to correct the ridgepole height. It turned out to be a relatively simple fix thanks to the jig I had the ridge sitting in. I bumped the pole out of the jig and tapped in a scrap of 2x6 cut to length, then dropped the ridge back on and tacked a couple scraps of 2x4 on the jig to make up for the height change. That done, I put a rafter across the top plate to the ridge, and the angles lined up perfectly. Since I was using the hurricane ties and not bothering with birdsmouth cuts, it became a matter of measuring spacing and tacking up rafters. I should note that this probably does *not* meet building code - hurricane ties are designed to reinforce a birdsmouth's connection, not replace it - but I believe it will be more than adequate for my needs. I'll be putting vertical ties on the inside of the top plate as well, just to be doubly sure. Doing this as a solo job is NOT easy. After dropping rafters more than once (one bending a cord-wrap-peg-thingy on my compressor, and a second bruising the heck out of my left tricep), I got smart(ish). I put a 2" 6d nail through the top of each plumb cut, tacked the rafter to the ridgepole, then nailed it on with the framing nailer. Then I climbed back down and nailed the hurricane plate to the rafter. I don't know if there's a "right" order to attach rafters, I put on the first rafter in from the gable on either end first, then just filled down the middle. 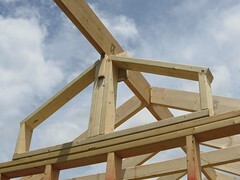 I got one of the gable rafters done before running short on time, so I knocked in collar ties on all the common rafters and took my jig out from the gable. Tomorrow, if the weather cooperates, I'll be putting in the last set of gable rafters, hopefully finishing the wall sheathing, and maybe getting some of the roof deck down. The gable overhangs are small enough that I don't need to cut lookouts - I'll do a barge rafter and let the roof deck hold up the barge rafters. Here's the jig I knocked together for the ridgepole - this is removed after the rafters are in so that I can put in gable studs. Just on top of the wall, you can see the collar ties. 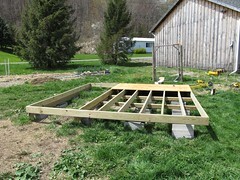 These are 2x4s, eight feet long, that are leveled and tacked to the rafter on either end to keep the roof load vertical instead of a horizontal/spreading load against the walls. End view, with a good look at the saltbox profile. 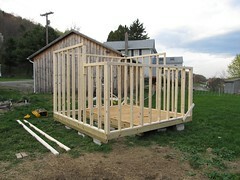 The chicken coop will be the left third that has a floor, the goats at the far (floorless) end, and the remaining space will be space for animal and garden supplies. And I can't thank DoubleTrouble enough for his tip about rafter hangers on the top plate to get things lined up. (Also known as hurricane ties.) Thanks again, friend. Crimson Trace: They are the gold standard for integrated laser sights. I've played with them numerous times and I like the setup. They've started offering different patterns and designs molded into their grip, and I believe they even have a wooden grip panel available for 1911s. If you're using a proper grip on your gun, activating the laser is automatic. Unfortunately, I don't love how their grips *feel*. Price-wise, they run the gamut from affordable ($180 for a J-frame) to rather pricey ($300+ for 1911 slabs). Viridian: Their main offering is rail-mounted lasers and laser/light combos. The units are small and light and intuitive to turn on. 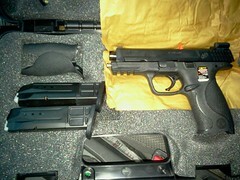 I was very impressed by the X5L and will be saving my pennies for one to put on the M&P. They're not cheap - around $325 - but for a green laser/LED light combo, I think it's competitive. BUT. And this is a big one... I would not, can not, recommend their 1911 product. The activation switch is, instead of a push button, a rotating switch. It requires pushing a small rubber nubbin 90 degrees around the axis of the slide release, and that little nubbin is TINY. I was unable to activate it with one hand without looking at the gun, and two hands meant my support hand was nowhere near a good firing grip. Poor design, and a potentially dangerous distraction. So that's it - my quick take on lasers from five minutes of playtime at the show. I can't tell you which is the best option for you, but IMHO, a weapon-mounted laser needs to be mounted and activated in such a way that it can be turned on one-handed, from a firing grip, without looking at the gun. Keep your head UP at all times. CTC and Viridian manage this, as does the StreamLight TLR2 (not played with). When I checked the M&P over at Gander, the batteries in the laser were nearly dead. It'd turn on for a moment at full power, and then fade to almost nothing as the capacitors discharged and the batteries couldn't take the drain. No big deal, as they included a set of replacement batteries (four of 'em, size 377) in the box. I got home and swapped in the new batteries in preparation for rough-sighting the laser. Turned it on, and started turning the allen screws... and the laser blinked out. I fiddled with the switch and screws a fair bit, and got it to work correctly. I went about the rough sighting, and got the dot and sights roughly co-witnessed. I turned the laser off, then on again ... and it wouldn't stay on. I pulled the batteries, put them back in, fiddled with the battery cover, and eventually got the laser to work again. Sort of. Sometimes it would stay on, sometimes it wouldn't. I emailed LaserLyte on Sunday evening to start the RMA process. They've been relatively prompt about replies - usually mid-afternoon of the following business day - but it's now Wednesday and I still don't have an RMA number. Last night I started dry-firing and found that when the striker falls, the laser flickers off for a fraction of a second. If the laser is in "pulse", it switches back to "constant". Working the slide seems to jar things enough to sometimes turn the laser off or change its mode. I may simply have a dud - I'll have a better feel for that when a replacement arrives. As it stands, I'd not suggest using the rear sight laser on a duty or home gun. Aside from possible defect issues, the laser itself is ... interesting. I like the concept. It's relatively small, easy to co-witness to irons, and light. The biggest drawback is activation. LaserLyte says they put the activation switch on the left nodule because that's where users wanted it. I think it's more likely they didn't know where else to put it. At least in my play, there is NO WAY to activate the laser on a draw stroke while maintaining a control grip on the gun. 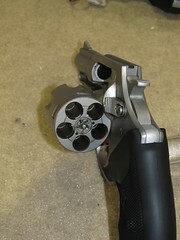 Using the thumb of the support hand is a possibility, but putting anything behind the slide of a semi-auto is a good way to damage yourself or malf the gun. As a training tool, however, it should be excellent. 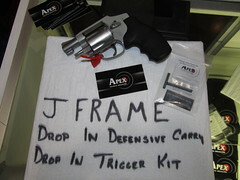 It'll show you flinches in dry fire, and just how steady your grip isn't when at the range. The weather has turned back to rain and chills, but the chicks are growing fast - the banties are almost four weeks old and the standards are a week behind. The stock tank they're hanging out in is getting crowded, and that Just Won't Do. Solution: damn the weather, keep building. I got the door opening roughed in last week while the weather was nice, after grabbing a clearance door from BBHIS (missing one piece of brickmold; more than half off retail). Thanks to the weather and my work schedule, work stalled right there. I spent a little time getting the plumb cut on the rafters over the weekend, and yesterday I put together a frame for the ridgepole and got that installed. Pictures pending. Then I tried to get a rafter up. Plumb cut was off. Birdsmouth was WAY off. I tried again on the other side of the rafter, so I could make a template to cut the rest. Still no go. After that beam split when I dropped it, I decided it was time to stop fighting and call it quits for the night. Sitting at the table after dinner and doodling on a pad of paper, I figured out why things were so far off... my measurements and calculations were based on my pad-and-paper line drawings, and I had forgotten to include the dimensions of the boards. My ridgepole-to-top-plate drop is 24", and the run is 48-1/2". Sounds like a perfect 6/12 slope, right? Except I was calculating from the TOP of the ridgepole to the outside of the wall, not accounting for the height of the rafter - about 6-1/4" with the plumb cut. So the rise is more like 17-3/4", and the run to the *inside* of the wall is about 43-3/4". In other words - the slope is going to be just a hair under 5/12. I think I may be on to something here. I may end up destroying another 2x6 getting it right, but I WILL get it. Eventually. I've had various guns come and go through my collection. Rifles, shotguns, pistols ... but none that would generally be called "tactical". Even an AR isn't really tactical when it's a 20" A2. No Kydex holsters. No rails. No tac-lights. Only one with night sights (that really need new tubes). It's not a particular aversion to the breed, I simply hadn't had the right combination of circumstances cross my path yet. Gander Mountain had a sale running through yesterday on Smith & Wesson M&P9s and M&P40s. I called the closest store to see if they had any in stock. Only the .40s. I think .40 is a perfectly acceptable cartridge, but 9mm is generally cheaper to shoot, and MrsZ prefers the recoil of 9mm to .40. I called the next nearest store, and they did have some available. 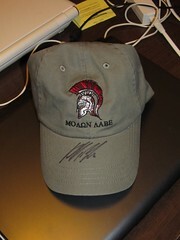 In fact, the person I spoke to (Aaron) said something like, "Yep, we have several!" He confirmed that they did NOT have the external safety, they came with two magazines, etc. I jumped in the truck and headed out for the 80-mile-one-way drive. I got to the store and found the gun counter (under the gigantic sign that says FIREARMS), and quickly found the M&Ps. .40 ... .45 ... 9mm with a laser ... .40 ... .40 ... 9mm with a laser... Hmm. One of the clerks asked if he could help me, and I asked if they had any M&P9s without the laser, as advertised. He didn't think so, but he'd check. I told him I'd spoken to Aaron earlier and was told they did have them. He grabbed Aaron, who went in back to check inventory. He came back a few minutes later and apologized for making a mistake, but the only M&P9s in stock were the ones with the LaserLyte rear sight laser. I was not real pleased, to say the least, and asked if they would price match, since the inventory mistake was his. 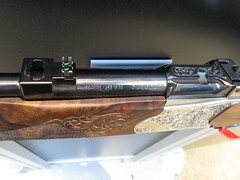 (The non-lasered sale price was $499, the LaserLyte model was stickered at $629.) He bumped me to a mid-level manager who quickly called a higher-up manager, and after a quiet back-and-forth they agreed to price-match the ad since I had driven up on their mistake. Range report one of these days ... if it ever stops raining. Major kudos to Gander Mountain for doing right by me. Apparently the ice cream machine was broken. I actually didn't notice, because I pretty much collapsed after work yesterday and don't have anything noteworthy to write about just yet. 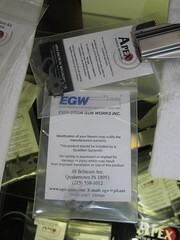 Hoping to make a trip to the range tomorrow to test out some ammo from LuckyGunner... if the weather will cooperate. Damn you, Tam. Why'd you write this??? GOG.com could be a huge money and time sink for me! They also have the Zork Anthology; Zork was the first computer game I owned. "You are in a maze of twisty passages, all alike..."
Does someone have a "pause" button for that thingy on the wall with the numbers? I worked Day Job 'til 3 yesterday, retrieved MrsZ from her office, stopped at my parents' place on the way home to move some tires (Dad is usually quite capable but is recovering from minor surgery and not moving so well), buzzed home, spent the better part of two hours swearing at the construction while I figured out how to frame in a window (next time, do it before raising the wall), nailed up two sheets of siding (also better done before wall-raising), then threw dinner on the grill. By the time we'd eaten, cleaned up, and sent my parents on their way home, it was past 9:30 and well into the realm of bedtime. It was a good day, just not as productive as I'd hoped. I'll be framing in another window tonight and trying to get some more siding on, and need to make a swing through BBHIS to pick up a door. I went home and finally had an excuse to use those shiny new ceramic knives I got. DAY-UM, those things are sharp! The weight of the paring knife let it slice cleanly into the meat, no pressure required. I cross-hatched the meat top and bottom and gave it a good shake of soy sauce, a dash of ground dinger, and a bit of minced garlic, then covered it and put it in the fridge to marinate overnight. Tonight I'll sear it on the grill and slice it thin, then serve it with some bleu cheese and a greens salad with balsamic vinaigrette and grilled asparagus spears on the side. When I last wrote about it, I had managed to dig and level the foundations of the barn. The weather seems to have finally broken (for a few days, anyway), and a friend came over Friday afternoon to help with construction. 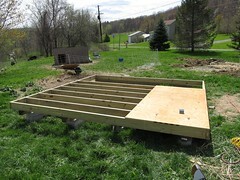 I'd already put together most of the floor joists on Thursday, then finished them Friday before he arrived. 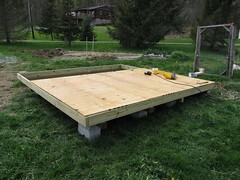 We put down one sheet of floor decking to square things up (diagonals are within 1" of each other; that's square enough for my purposes), then all the remaining exposed joists got nailed to the skids underneath, effectively locking everything together. And then it was time to start framing the walls. Note the step in the wall. Instead of even-length slopes on either side of the peak, I decided to build this in the "saltbox" style, with even pitches and different length. Working on the installed floor means we have a clean - and more importantly, level - surface to work on. 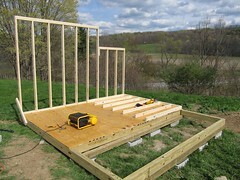 The sill plate was laid out and marked for 16" centers, then studs were cut to length and nailed on with 3" framing nails and the air nailer. A single top plate was then nailed to the tops of the studs, and a second top plate nailed to the first one with 2" nails. The second wall was built in much the same way as the first, but note the double stud two-thirds of the way down. Those studs are 3/4" longer than those to the left, to accomodate the difference in height between the decked and undecked portions. The top plate is common, the sill plate is in two pieces. Observers with a clue will notice one critical item missing from this project - doors and windows. We hadn't decided on where to place those yet, so I will be cutting out the frame for those as soon as we decide. Soon. 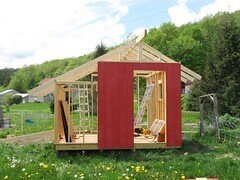 I put one coat of paint on the sheathing Saturday and sealed the back Sunday (we're using LP Smartside, which is rated for structural use), and hopefully this afternoon I'll get some of the sheathing installed so I can start working on the roof framing. The weather forecast for the next several days is gorgeous, so here's hoping! Real life is settling back in. We got home Monday evening, and I worked 14 hours Tuesday and Wednesday. 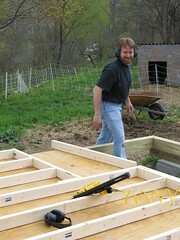 The sun has come out, maybe even for a couple days, so I'll be scrambling to knock together the barn as fast as I can. Weerd - the hotel had the local PD's CSI unit on-scene when we left Monday morning. Seems they're looking for DNA of whomever poop-nuked the koi. 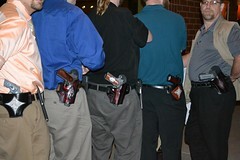 Open carry is legal in Pennsylvania. I (and several others) chose to take advantage of that. 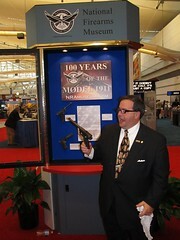 I spent the whole weekend with a steel government 1911 strapped to my hip, and it was great. Due to the crowds, I spent most of the weekend with my Galco FLETCH retention holster (thumb break), but Saturday night we dressed up and I work my Dragon Leatherworks Talon. This was a gift/review copy from Dennis, and I couldn't be more pleased. Pictures pending, but it held my 1911 perfectly and looked GREAT doing it. I got a few glances here and there from folks, a few nods from officers, several questions of whether or not I was law enforcement, and one interview by Liston Matthews of the Knoxville Examiner. We discussed open carry in general, normalizing it, and not scaring the white people. I don't have a dog in the fight on open carry (that's a long way down the road in NY), but I believe we need to stop being our own worst enemies. Leonard Embody scared the white people by openly carrying his AK pistol in a park. It was entirely legal for him to do so, and anyone who claims otherwise is lying. I may not agree with his actions, but I don't have to - it's his right. 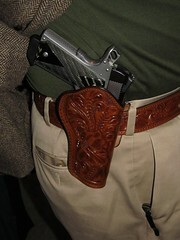 I enjoyed openly carrying. I enjoyed having a beer with friends while openly carrying. 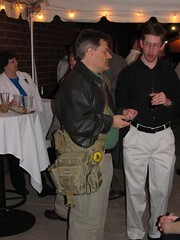 I never got intoxicated - that's a personal rule; two drink max while carrying. It was nice to carry a full-size defensize pistol without having to worry if my cover garment was going to slip or get wedged the wrong way. And the best part? No one cared. 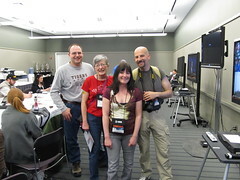 Sunday dawned gray, and MrsZ and I slept in, had a leisurely breakfast, and finally rolled in to the show around noon. We spent some time wandering the main floor (what I termed the "beef jerky floor", because it felt much less like an expo and more like a traditional fun show), checking things out, and met up with Elmo Iscariot and one of his better halves briefly. The whole show was MUCH less crowded than it had been the preceding two days, and I was able to spend some time really talking to vendors. 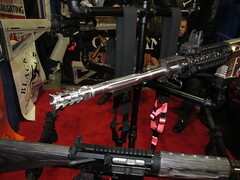 A stop by the Apex Tactical booth brought up some VERY interesting products, particularly for the competitive shooters. First: a hammer/sear drop-in kit for 1911s, which runs about a hundred bucks and will bring trigger pull down to about two pounds. Their sample gun was VERY clean-breaking and light. Weerd and I played with it a bit, and discussed it with the reps. Short form: redesigned hammer/sear geometry crisps things up. It also will need some tuning of the mainspring and probably a new recoil spring, but for a race gun with light loads, it could be a great setup. Their rep did specifically say that a heavy spring set could cause enough recoil to slip the sear, which is a VERY BAD THING. So, neat, but use with caution. Clearly NOT a carry option. 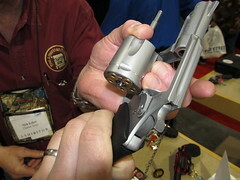 The second piece they were showing was a tuned up S&W 627PC eight-shot .357. It had a new bobbed DAO hammer, new springs, and the action had been tuned to about three pounds. Yes, a DAO three-pound pull. Unbelievable. 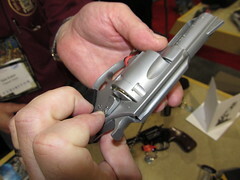 The rep cautioned that it requires handloading with Federal primers in order to insure consistent ignition. Still, a beautiful piece. Labor is $275 and the hammer and any other parts would be additional. And the last thing on their table, arguably the most interesting to many shooters, was a new spring/firing pin set for S&W J-frames. Factory action on a J-frame is about 12-13 pounds; their springs bring it down to about nine, and smooth as silk. I asked about reliability and light strikes given the lightened springs, and they admitted to some light strikes during initial testing, but have since started shipping the kit with an extended firing pin that (supposedly) resolved the issue. For $25, this is worth considering. I picked up a set and will do some testing of my own over the next few weeks! He may have been slightly under-the-influence still, as he tossed a set of Revision Hellfly eyepro to us with his compliments. I can't wear them (damn you eyeglasses!) 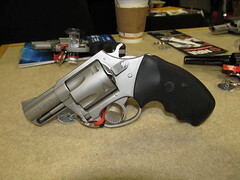 but MrsZ can, and I'll be putting them in the range bag as extras for new shooters as well. 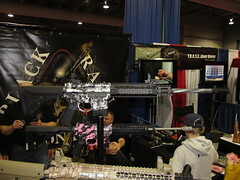 From there I moved over another aisle to Black Rain Ordnance and looked at some VERY pretty AR-style rifles. No prices listed, but their site shows prices starting around $1500 and going up. I love the barrel profiles, the milled receivers are gorgeous ... but the flash hiders have a definite "WTF" quality to them. They're awful nice. For a carry option, that'd be tough to beat. 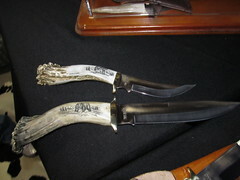 Still, for $1300, they ought to be nice. 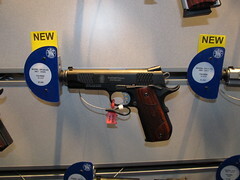 Also of note at the S&W booth, the display M&Ps had triggers like gravel. Honestly, the worst trigger I've ever felt on a production gun. I hope that's not indicative of the series. 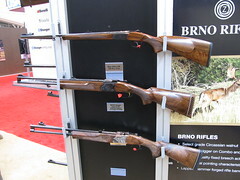 They had a PC Model 60 on the stand as well that had a 18+ pound trigger pull. I grabbed Weerd and said, "Hey, feel this." He did and his reaction was the same as mine: WTF? 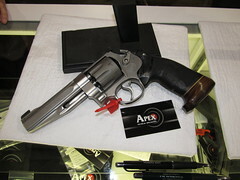 I grabbed a S&W guy who first tried it single-action and said it was fine, then I told him to try it double-action, and his reaction was, verbatim, "Wha... wow, that's fucked up." It was the last hour of the day, so they didn't pull the display model, but glad to know I'm not completely crazy. They did, however, let me handle the others in the case, including the Luger entry, a Colt 1911 (serial number 4), and a C-series Colt 1911 that went to Guadalcanal, iirc. 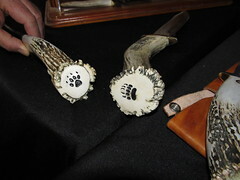 Amazing pieces of history, and what an honor to handle them! Sunday evening, the remaining folks had dinner at a chain steak house, then retired to Newbius' hotel room to have a few beverages and play show'n'tell. 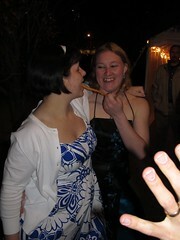 MrsZ and I left the show early-ish on Saturday so we could head back to our hotel and get cleaned up for Gunnie Prom. After a scenic tour of the Pittsburgh suburbs (no thanks to you, TomTom) we made it to the hotel and got all prettied up. Getting back in to town was easy, parking was easy, then we (I) confused Penn Pl. 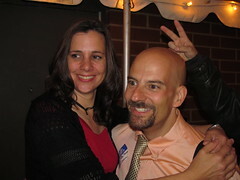 with Penn Av. and we wandered about eight unnecessary blocks. From the SAF reception we meandered over to Lidia's for a reception on the patio, arranged on short notice by NFO, and a hell of a good time. Good food, good bourbon, and great company. 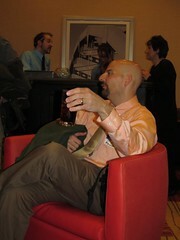 Alan Gura and Alan Gottlieb were there, and I hovered on the edge of the conversations they were involved in, but truth be told, most of what they were talking about was over my head. Legal matters are important to me, and I try to follow the key points, but the minutiae of cases just don't interest me. As the reception wound down, several of us walked back to the parking garage we were in together - a nice walk with great people, and comforting having a few extra eyes (and guns) in what was trending towards a less-polite neighborhood. 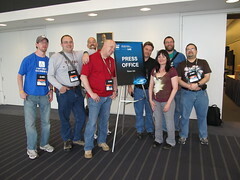 I just moved a BUNCH of people from the "blogs I read" to "bloggers I've met" list, and I'm sure I didn't get everyone. Do Heath & Amanda have a blog? I'm sure I've missed a few, I assure you, it's not intentional, and please let me know! ... but get the hell off our convention floor! Day 3 wrapped up the show, and I'm exhausted. However, I'm going to hang out with the few bloggers remaining in the area, and an update post will have to wait until tomorrow or Tuesday. Suffice it to say that I'm still not sure I saw everything, and I have some interesting things to look in to!